Doesn’t look like much but what is perfect about stew is , it’s a one pot meal. When you’re busy and everyone’s hungry, you really appreciate being able to chuck everything in one pot and out pops a full meal. 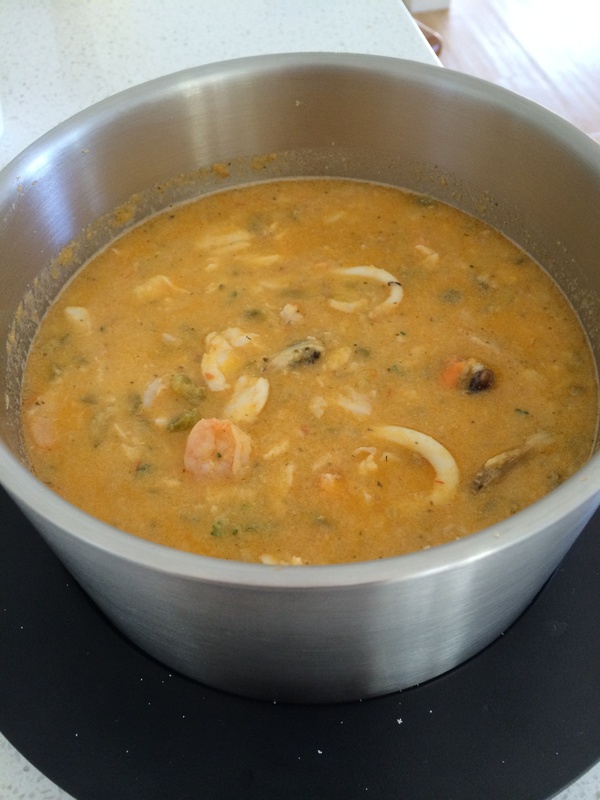 Wondering around the supermarket today, thought it was time for a seafood dinner, checked on the thermomix app for a suitable recipe and found this yummy seafood stew. 20 minutes prep time sealed the deal for me. Just grabbed the ingredients; mixed seafood from the supermarket. Chopped up garlic, herbs and onion in thermomix, added tomatoes, capsicums, fish stock, coconut milk blitzed into a sauce and that was cooked earlier today in the thermomix. All that was needed to complete the dish was to add the seafood and cook into the sauce. Very simple and another tasty meal. Kids were served this over pasta and parents had it over rice. Chopped chives and coriander complete the dish and it was cooked in six minutes. Next time I’ll add more vegetables into the sauce. The kids won’t normally touch capsicums but blitzed into the sauce they’re none the wiser. Everyone happy, another winner recipe and a new dish to add to the family menu. Yah!